The residential centre for the Williams River Valley Artists’ Project. The following is an extract from the website of Margaret Roberts. “Manns Hill Hut is modest architecturally, but not only has it been lived in by many people, it has been involved in the major events of war, migration and climate change in its 70-year life. 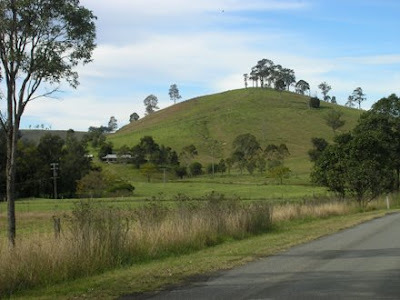 It is located in the Williams River Valley NSW, Australia, just north of Dungog, three hours drive or train-ride north of Sydney. Dam proposals have been aired periodically (and successfully opposed by the local community) since the 1950s because, it is said, the natural land formations of the Williams Valley mean that a relatively small dam wall would contain as much water as occupies Sydney Harbour. The Manns Hill Hut is located beside the river on land that was cleared and dairy-farmed for five generations by the family of the organiser of the artist-group, Juliet Fowler-Smith. The building was brought there in pieces on trucks in the early 1960s when her father, Snow, bought it for £150 when the Greta migrant camp (just north of Maitland) was being closed down. 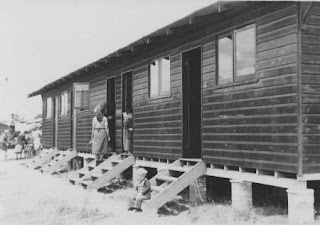 The Greta migrant camp 1949-60. Snow was working for the Department of Agriculture by then, and employed share farmers--who are also long-term Williams Valley residents--who still occupy the one good house on the farm. 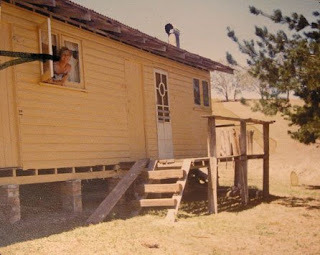 The hut was for his regular trips to the farm (mainly to keep the rabbits and weeds down, he says), and as the second home (especially in school holidays) for his four daughters. It was built as an army hut for men being trained for the Second World War, composed of approximately 17 x 5.5 metres of open space, with doors at each end. When it was converted in 1949 to house migrants, mostly women and children (the men were employed elsewhere - on the Snowy Mountains Scheme, etc. ), coming to Australia to escape the devastation of the same war, internal walls were added to make space for three families per hut. 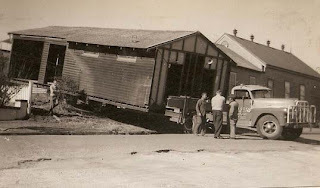 When the trucks brought the hut to the Williams Valley just over a decade later, one third went to become part of the Munni Public School (and was later lost when the school burned down) and the other two-thirds was installed at the base of Mann's Hill and gradually had lino, toilet, shower, pantry, verandahs, and garden patches added. Eventually an entire new roof replaced the existing fibro roof after it began to leak. Twenty years ago, another third was built on as a self-contained extension for Snow and his wife, Bremer, as by then the hut was often fully occupied by one or more of their daughters with their families and friends.